A definite highlight of the year, this week saw us embark on an exhilarating journey of the senses when Star World partnered with Food Talk India to host The Blindfolded Mystery Meal – very clearly inspired by the iconic MasterChef Australia series. Verve headed to Olive Bar & Kitchen in Bandra for a one-of-a-kind gastronomic experience. Even before we could admire the funky PlayClan blindfolds placed at each table, detailed rule cards were pushed into our hands. Clearly, this was a more serious affair than anticipated. Apparently we now had to remember rules while doing our best not stab ourselves with a fork. Blindfolds on, our first blackout had us panicking a little, when a voice told us to hold out our hands. Said voice then placed sticks in each of our hands while large plates with something leafy were placed in front of us (yes, we touched it). Before we could get to the plate, we were told to eat what was in our hands first. “What?! The stick?” Turns out there was something super cold at the end of it…ice cream? One bite and our minds were blown with cheesy, nutty goodness. The plates were wiped out in five minutes, with us shouting out “Arugula! Beetroot! Orange!” as we tasted. 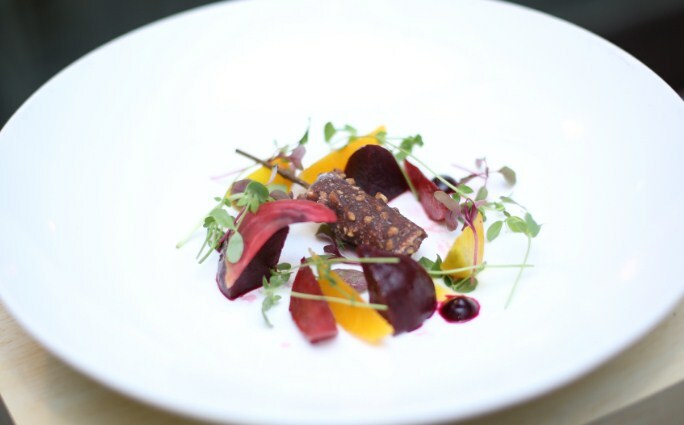 Mystery Solved: Goat cheese and burrata choco-bar, heirloom beetroot, rocket leaves or arugula, plum, hazelnut, orange. We were better prepared for the dose of darkness this time round, quietly and confidently waiting to hear the ‘clunk’ of the plate being placed on the table. What immediately perked us up, though, was the smell. “There’s definitely cauliflower in this one,” we sassily declared. Finding only spoons next to each plate, we began to scoop up whatever delights were awaiting us. The universe must have been on our side that night, because the first mouthful was that of the most perfectly-cooked succulent prawns. 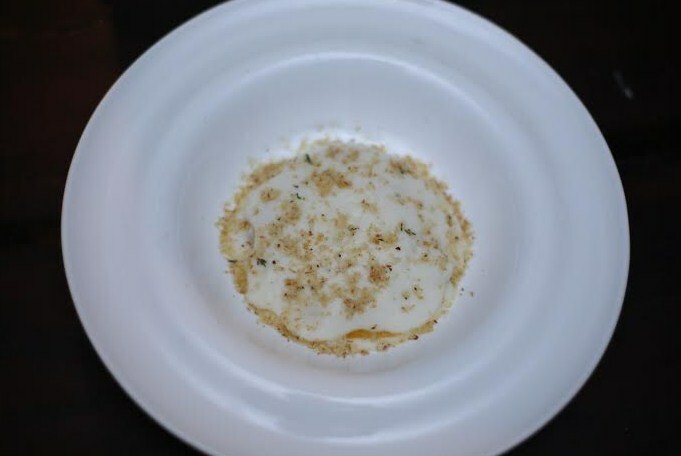 Something sweet, something crunchy, something that we thought were potato bits and a yummy white sauce kind of mousse…but where was the cauliflower? 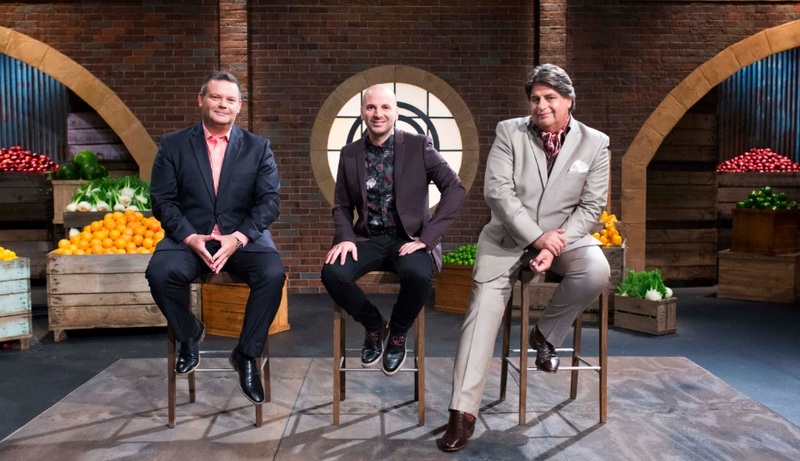 Mystery Solved: Cauliflower mousse (! ), prawn, pine nuts, sweet garlic crunch, truffle oil. 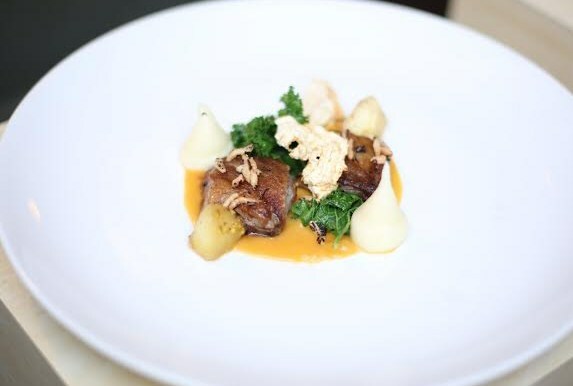 Mystery Solved: Slow braise pork belly, piccalilli puree, mash, mustard apple, kale, pork crackling and black rice granola. First thoughts: “Please let there be chocolate.” Which self-confessed dessert addict loves fruity desserts anyway? As the most eagerly-anticipated part of our meal arrived, we picked up our noticeably smaller forks, took in a deep breath (the sense of smell being heightened and all that jazz) and knew this would be an instant treat. Biting in, a rich citrus taste with a pop and crunch awakened pretty much every sense. “Are these rice crispies? Nougat? Praline?” The commotion around the entire room of blinded foodies began. Bursting fruit broke through our chain of confusion, followed by a light, fluffy dark chocolate mousse. Every spoonful gave us something delectable and something new to analyse, even while we convinced ourselves that our eyes were starting to throb. All’s well that ends well, right? 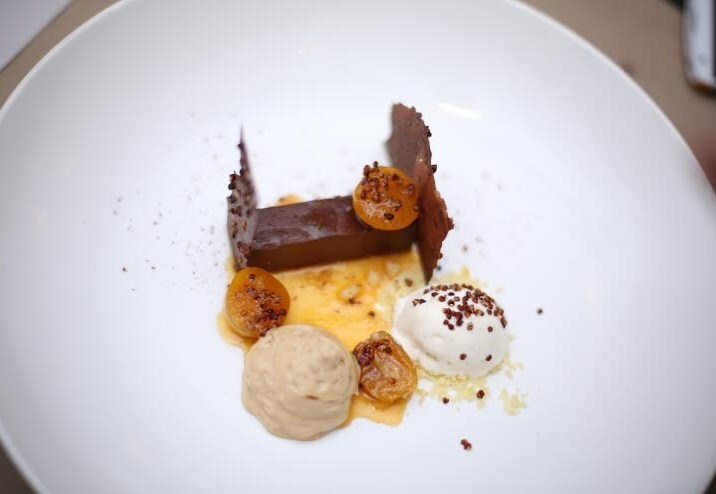 Mystery Solved: Valrhona chocolate ganache, poached kumquat, orange sorbet, caramel popcorn mousse, quinoa and cocoa nib crunch.